There's some things in life you probably shouldn't admit to, what's about to follow is one of them. At this time last year, the wife and I were celebrating our first anniversary and where else does this brilliant man choose to dine on such an important occasion, Chili's. Ok, to be fair to myself, I woke up early that morning and picked up flowers from the florist who did our wedding, then a cake from our cake people, and took my wife to Storm King for a picnic and a day in the sculpture park. On the way home we drove by the outlets and decided to stop. That excursion quickly dissolved into Wal Mart, and while we were being classy, we went for dinner at Chili's. Chili's oddly enough does play into stories of our courtship years, but that was a long time ago, and on last year's anniversary we quickly learned that Chili's is not an establishment to celebrate a momentous occasion in your life, nor is it a place either of our stomachs cares to tolerate anymore. One important thing did come out of the dinner though, honey and chipotle together on chicken is fantastic. At that fateful meal I had chicken fingers coated in a honey-chipotle sauce. 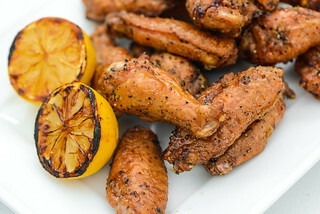 While the flavor was excellent, I was left with a way too heavy feeling in my stomach, which lead me to take a somewhat lighter approach to these at home and use grilled wings instead of battered and fried tenders. 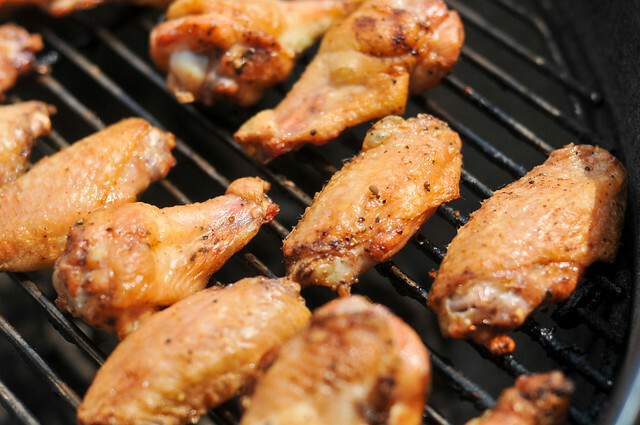 The wings were coated in baking powder and seasoning and set in the fridge—this ensures a crispy, textured skin. While those were resting, I contemplated sauce. I saw no reason to expand beyond the two simple ingredients, honey and chipotles in adobo. What I did have to consider a bit more was the proportions. 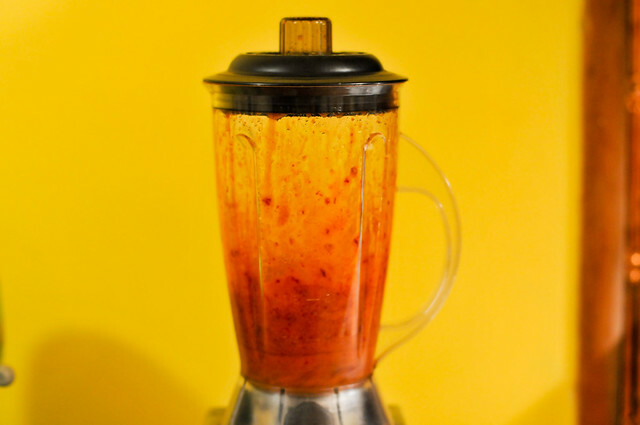 Knowing the sauce would be grilled, I wanted a mixture that seemed a tad too spicy because when it's exposed to the heat, the sugars will come out more and achieve the balance between sweet and spicy that makes this sauce a stand out. After 8 hours in the fridge, the wings were ready for the grill. Cooked over indirect high heat, it took about 40 minutes to get the crispy crust that is essential for good wings in my opinion. I wanted all the cooking to be done prior to applying the sauce, because I knew that honey would quickly burn over the fire. 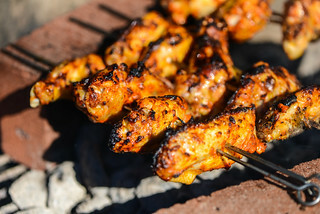 As insurance, I brushed the wings over the cool side of the grill, then moved them over to the hot side, were they browned and charred in about a minute. Once they started to get little black patches, I removed them to a plate for a quick rest. There they are, my pile-o-wings, and boy were they delicious. The first taste starts with a crisp bite of sweetness, which quickly turns into a smoky heat that leaves a slight burn in the back of your mouth. The only way to cure that is an additional hit of that initial sweetness from another wing—a deliciously addictive pattern. I can't say I'm upset that Chili's will may never be in my diet again, but for whatever shame and pain that anniversary visit created last year, at least it left me with these incredible wings. 1. Pat the chicken wings dry with paper towels. 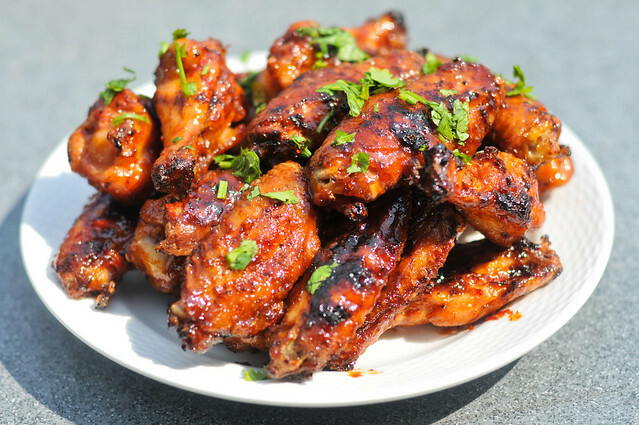 Place the wings in a large bowl and sprinkle with the baking powder, chili powder, and salt and toss to evenly coat. 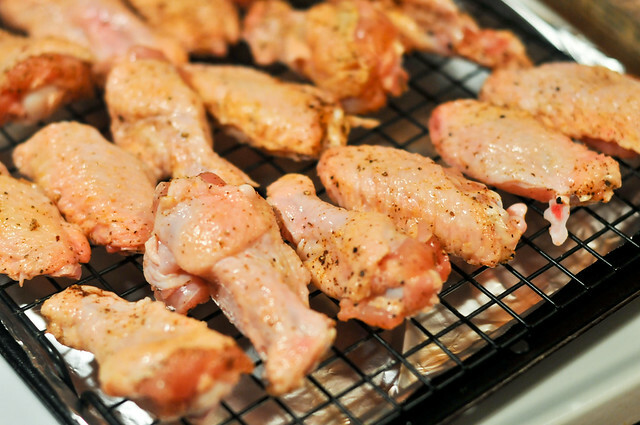 Arrange the wings in a single layer on wire rack placed over a baking sheet. Refrigerate uncovered for at least 8 hours. 3. Light a chimney 3/4 full of charcoal. When charcoal is fully lit and covered in gray ash, pour coals out and arrange them on one side of the charcoal grate, keeping the other side empty. Clean and oil the grilling grate. Place the wings skin side up over the cool side of the grill, cover, and cook until skins are crisp and are starting to brown, about 30-40 minutes. 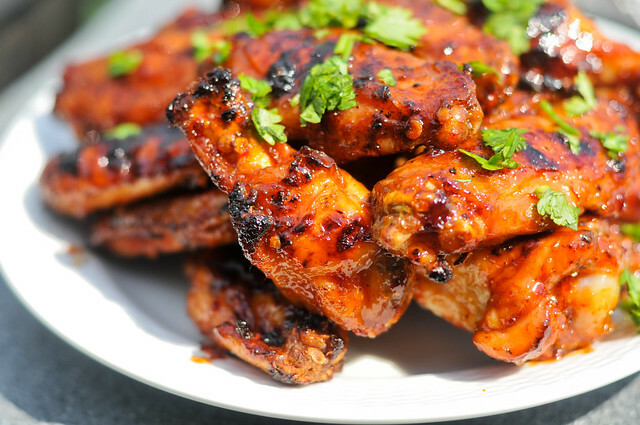 In the last 10 minutes of cooking brush the glaze all over the wings. 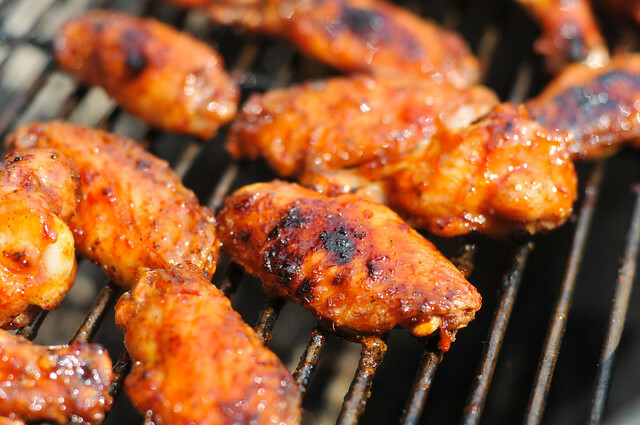 Brush the wings with the glaze again and move to the hot side of the grill until the just begin to char, about 1 to 3 minutes. 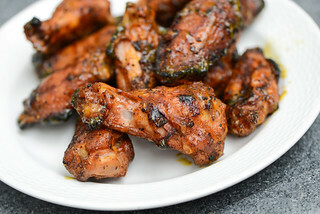 Remove the wings to a plate, sprinkle with cilantro, and serve. These spicy beauties look extraordinary. Did you deseed the chipotle or just throw them in whole? these were awesome. nice and crispy, and flavor just like willow street pizza's "willow wings." i will be making these again. thanks for the recipe! @Carol Glad to hear you like this recipe! @carol Yes, I'd season the chicken before grilling with the salt and chili powder. The salt was for seasoning, but in the case of skinless chicken breasts, if applied to the chicken and then let sit, it will act as a brine, enhancing the flavor, texture, and moisture of the meat. Can you be more specific about the adobo. What exactly was in it and how much? @Rob It's the adobo sauce from the canned chipotles in adobo. Love the sound of these but where do I buy ancho chili powder and adobo sauce in Chester, England? Please let me know as I would love to try these or if anyone can let me know of a substitute much appreciated. @heather Not sure what you can get in England, but a standard chili powder would be fine. You're looking for an earthy pepper flavor without a lot of heat. Josh- I only have a gas grill, what temperature do you recommend and for how long? Thank you!! @Jessica Shoot for around 425-450°F for about 45 minutes%u2014let the wings cook until crispy. Josh-- thank you! I went ahead and made the cajun spice wings. My gas grill has cool spots, so I cooked them for about 5-8 minutes a side on the cool spots first and then went to char them. They were absolutely amazing! Cannot wait to make again! Thank you! Last night was the third time I have used these recipes for parties. I have now tried 6 of the 10 and all were great. None of them have overpowering heat from the peppers so everyone can enjoy the great flavors. I always get big "wows" from my friends when they bite into them. About how many wings would your recipe coat? I'm looking to make about 60 wings. Should I double the recipe? Nevermind, I see the 3lbs now. This is the Best Chicken I have ever cooked. Probably the best Chicken I ever tasted. Did not have 8 hours to let it sit before grilling it and still worked, probably crispier if I would have had time.